Just the day before we were to leave for Dehra, we got to know that Bond had consented to meet us. In true fauji style, we reached well before the appointment hour and decided to kill time before climbing the stairs to his hilltop pad. Through the towering conifers we could see the steep winding road down below. 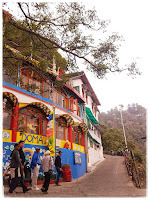 Away from the hustle bustle of touristy Mussoorie, here, at Landour (Mussoorie’s twin station) it was silent and peaceful. Somewhere, a blue whistling thrush trilled calling out to a mate. Few sparrows were chirruping around. From time to time, we glanced at the closed window of the house that the driver had pointed out to us as the writer’s home. Presently, we saw the doors thrown open and, for a brief instant, a familiar visage appeared in the window, looked down at us, and promptly disappeared. We must have looked like a bunch of teeny boppers gawking at the abode of a celebrity star. Soon, we were face to face with one of India’s best-loved writer. The excitement was two-fold as we were visiting him in his den. There is something about the creative space of an artist. It exudes an aura of the owner’s persona that a conversation may not reveal and that his books only partly suggest. The modest-size room is choc-a-bloc with cane furniture, books by the walls, rugs on the floor, and other personal paraphernalia – some photographs, framed certificates (Sahitya Akademi award, Padma Shri and Padma Bhushan), a sketch of the roly-poly author walking by his abode presented by a fan, and so on. The room is presentable and tidy. 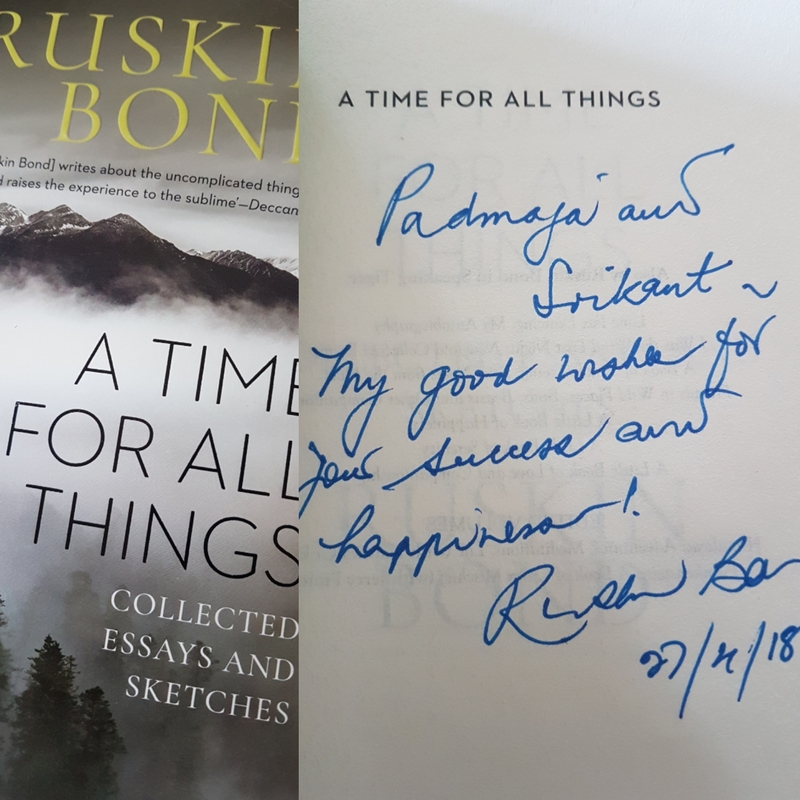 Ruskin Bond has a twinkle in his eyes which reminded me of his essay, “Running for cover” in which he parodies visitors who come to see him. Only he certainly is not running for cover but having us for a ‘meal’, instead. Nothing–from our facial expressions to mannerisms and talk−would have escaped his acute writerly vision. I imagined a caricature of a certain ‘naval couple’ finding column space in his next ramblings. He tells us how visitors come to show him their manuscripts and writings that, more often than not, are written in bad English. We enquire after his health. “I sleep a lot more,” he confesses. At nearly 84, his hearing and memory is razor sharp. The fact that he continues to read and write avariciously may have a lot to do with it, he admits. “Few days back I realised I had finished reading everything I had in my home library, so a friend got me the entire collection of Agatha Christie; I devoured that too. Now I have nothing (books) to read.” He averages one book per day. I was glad to give him something to read. 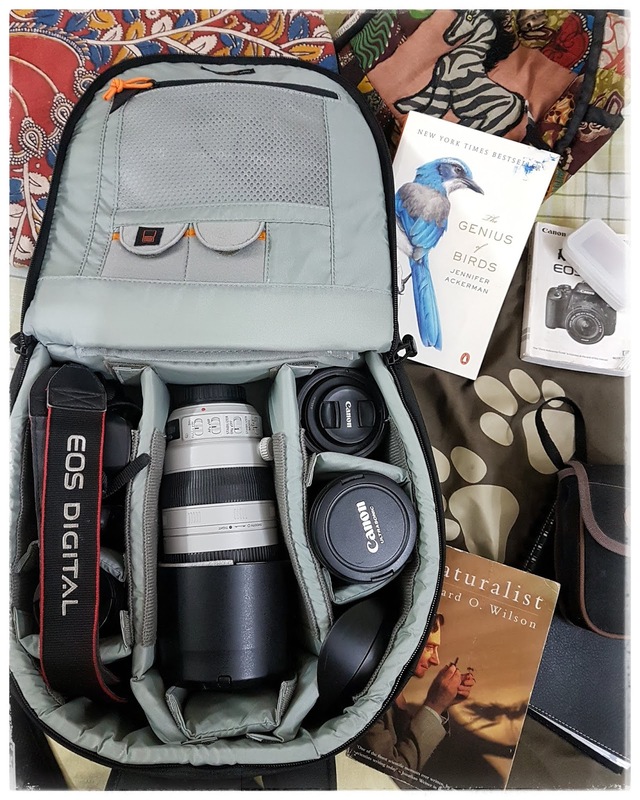 My brother had gifted me the New York Times bestseller, “The Genius of Birds” by Jennifer Ackerman that I had carried as my travel read. I usually carry something for people on a social visit, but our meeting with Bond was sudden and last minute. Therefore, I simply carried this book to gift it to him. He still writes in longhand. He did work on a typewriter –“an Olympia vintage, not Godrej”, he reveals. He was reminiscing the time, not far in the past, when “someone who was doing a book on Godrej typewriters” had come to visit him. I was sure it must have been my photographer-friend and once-upon-a-time colleague, Chirodeep Chaudhuri who did the 'Godrej' book, 'With Great Truth & Regard: A Story of the Typewriter in India'. It was, indeed, as I got to know later. Bond's Olympia is past its prime now. My husband tells him of our antique Remington typewriter bought from a flea market in Kenya and his passion for collecting such antiques. Bond immediately quips: “You can have mine”, revealing his generosity of spirit. It was this trait that saw Bond adopt a local “family” who stays in his pad without infringing upon the writer’s domain. 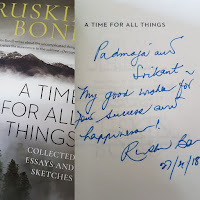 True to his genre of writing, Ruskin Bond’s is a slow world. No cellphones, no whatsapp, no social media. He permits himself emails, mainly to stay in touch with his publishers. A closer look at his private world–his preoccupation with the ordinary, and simplicity of writing and living–is a revelation. It seems nothing short of a miracle that he has come to be such a successful author, particularly in an era where there is a glut of ponderous literary tomes by highly-paid celebrity authors. Perhaps, the answer lies in his quote: “Don’t try too hard, then you are sure to chase success away...” or something to that effect. I am a writer without regrets, and that is no small achievement! As he starts signing our books, I ask him if I can shoot him. 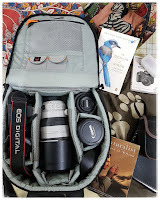 With my passion for photography, I had gone armed with my 50mm f1.8 prime portrait lens. Bond sportingly consents and as I remove my lens from the camera bag and prepare to fix it, he is amused. “Oh, you have a proper lens and all. 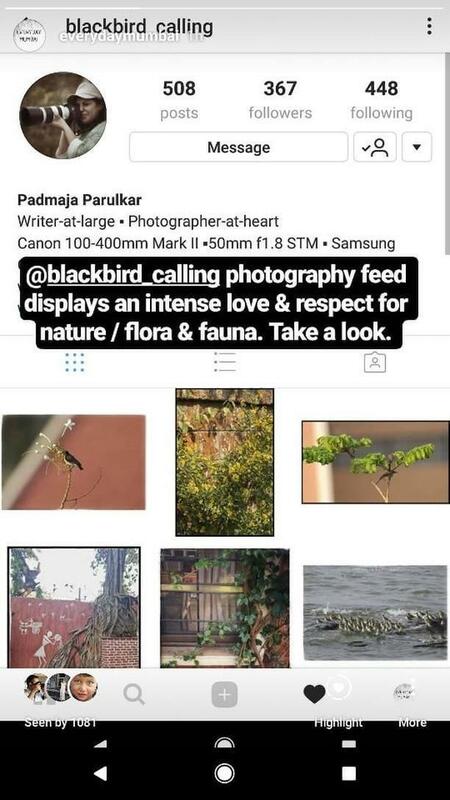 You seem to be serious about it.” Hubby interjects to tell him how I had stopped writing in the pursuit of photography. He is eager to know the reason why. I say, I don’t quite know but I just seem to have lost the ability to write. Much to our surprise, he tells us of a time when he was hooked on to photography. It was in the pre-digital era, of course, and he used to shoot black and white. He confesses that as he wielded the camera his ability to wield the pen took a backseat. “I was more involved with the act of composing a picture than actually taking in the surroundings and being alert to what people around me were saying.” Thus, his dalliance with photography did not last long. Does he still go on long walks all the way to Lal Tibba (the highest point in Landour) where he, at times, encountered leopards? “I go for evening walks, but not very far. In the last five years or so, people–tourists and trippers–have suddenly started recognising me. 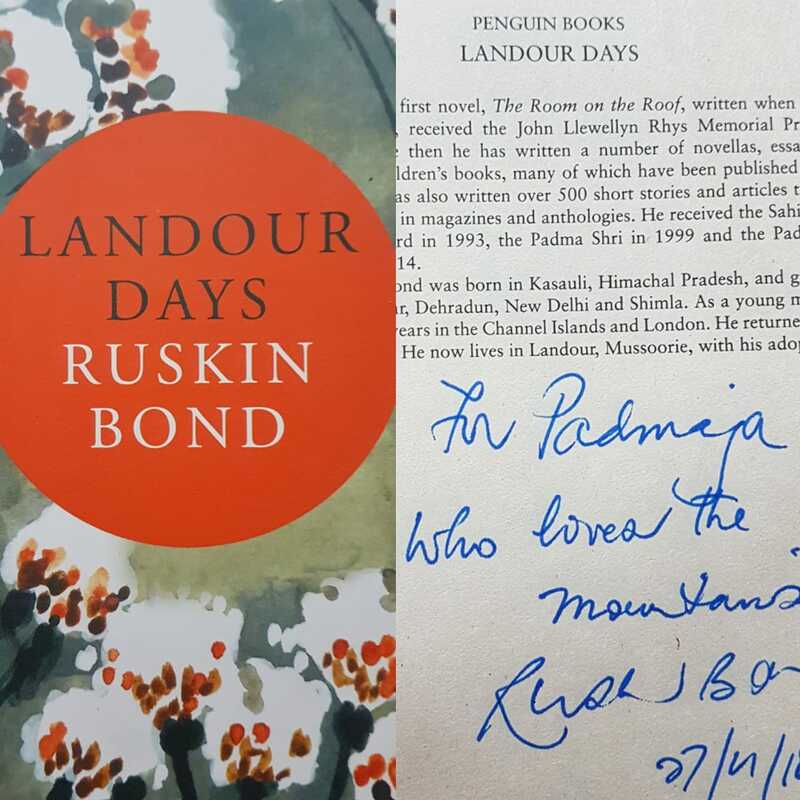 They point at me and say: ‘Ruskin Bond, Ruskin Bond’," he laughs. Does that bother you? I ask. “It doesn’t bother me, but that’s the end of my walk. So now I sneak out at night,” reveals the writer with a glint in his eye. (I hope I am not letting out a secret!) 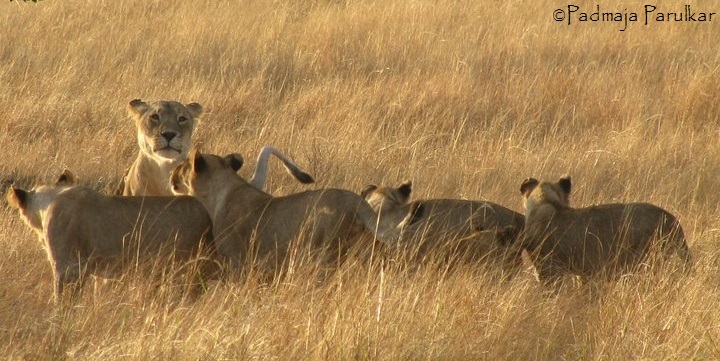 Leopards, jackals and foxes still lurk around and claim their right to the night. He doesn’t socialise much but does know people – other writers and celebrities – who have settled in Mussoorie. The Gantzers are one such couple. We were acquainted with Hugh and Colleen; I had profiled the husband and wife travel-writer duo for a Sunday newspaper I was working with once upon a time. My husband knew Hugh as he was a naval commander before he became a writer. Bond promptly offers to call them from his ‘tring-tring telephone’ – another relic from the past - and arranges a meeting! He says they will be happy to meet us. We talk desultorily about this and that. And then, all too soon, it is time to leave (we had been granted an hour). As we get up, I see a pot of red geranium on his writing table in the adjacent room. Gazing at his geraniums, I am transported into his creative world. “Geraniums are good companions. I can meditate upon a geranium. That is, I can spend a long time gazing at one.” I recalled his lines. I tell him that I am carrying some saplings from the Academy as souvenirs for my home garden. He is eager to know which ones. He asks me if geraniums do well in Bombay. The window with hill-view has been a recurring motif in his writings. “A long and ne’er-say-die search for the perfect window. This would be one way to sum up my life… It wasn’t until I moved into my present abode, a windswept, rather shaky old house on the edge of a spur that I was truly satisfied,” he writes somewhere. I want to look out of his window very badly and ask him if I could. He welcomes me to his “sunny” room - with geraniums by the window - which is also his bedroom. The whiff of crisp mountain air and the vista take my breath away. 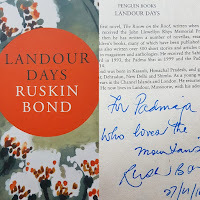 Ruskin Bond had “run away” from Delhi ages ago to make home in the hills. Landour has been home for long for the man who walks among trees. We say our goodbyes and as I climb down the steep flight of stairs I am all admiration that his knees still take him up and down these. We pause down below to savour the soiree before being rudely thrust into the touristy world. On the hillside, amidst pink heather a party of streaked laughing thrushes is frolicking about, a last romp before day-close. 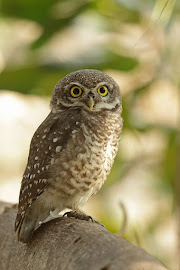 In the evening chill, I feel warmly hugged in a “fantasy” world that Ruskin Bond brought alive. Some people choose to sail around the world in small boats. Others remain in their own small patch, yet see the world in a grain of sand. Back home to the grind of the megapolis that is Mumbai, my rendezvous with Bond seems distant and unreal - as unreal as is the salubrious mountain air to the polluted one of Mumbai. ALSO DO READ PART I on how we almost didn't meet!